A Wolf from the Lamar Canyon Pack looks down on her prey, a Mule Deer buck, during a December snow storm in Yellowstone National Park. Captured with a Canon 7D and 500/4.0L IS + 1.4TC II set in aperture priority mode with an exposure bias of +2/3s at f/7.1, ISO200, and 1/320th of a second. Mounted on a Gitzo 3540XLS tripod and an Induro GHB2 head. 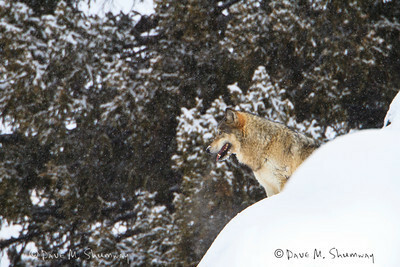 My December trip was a blast, and as usual, quite productive in terms of seeing and photographing predators in winter. There was no Christmas Bear this year; but I did see Wolves all the days and my first two days were each three dog days. Day two had the real excitement when 5 of the Lamar Canyon Wolves chased a Mule Deer buck right down to me, they were unsuccessful in their hunting attempt, at that time; but they did stay long enough to pose for some photographs, and the snow let up enough at the end of the encounter for me to make some images. The Wolves left up the hill after a 30-40 minute standoff, and the Mule Deer buck followed 10 minutes later. I waited until the light was gone and headed out of the park for the day, thinking he had gotten away. The next morning after being asked to leave the park, as they were closing the roads, I waited "patiently" having coffee with some friends in the parks gift shop. Waiting and hoping for a third consecutive three dog day, I shared my encounter with the group, discussed park politics, weather, and the promise of a great day following the lunar eclipse (a great day that happened; but I had to be back in Billings for work). When, at 10 am, they re-opened the roads we all rushed in to see what we could see. Upon arrival at the spot I had left the Wolves and Mule Deer, we discovered that they had infact been successful in killing the buck, and Coyotes were gorging themselves on the remains of the carcass. The wolves were miles up on a ridge resting much of the day, Coyotes were everywhere enjoying the nice sunny day after days of heavy snow; but despite my best efforts I could not find a Fox to complete my trifecta. I hope you enjoy the images, Happy New Year.